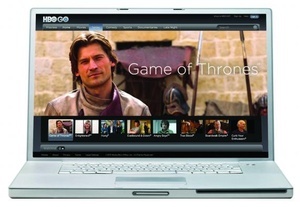 According to Bloomberg, Apple is in negotiations with Time Warner to begin offering the popular HBO Go application. The app would be made available to Apple TV set-top box owners by mid-2013 if all goes to plan. If you subscribe to HBO, you will be given streaming on-demand access to over 600 hours of programming including movies and the company's original programming like True Blood, Game of Thrones and Girls. Apple TV, long regarded by the company itself as "an experiment," streams content from Netflix, Hulu Plus, and other on-demand channels. The box has seen extreme competition, however, from rivals like Roku and gaming consoles such as the Xbox 360 and PS3. The company has sold over 10 million Apple TVs since its introduction 3 years ago.